The best part of her day is…Talking to scientists from all over the world—from collaborating with neuroscientists to create the first 3D model of an octopus brain to conversations with astrophysicists about the end of the universe. Advice every UC San Diego student should know…The best way to learn is by doing. Think strategically about what trajectory you want to follow, and then work backwards from there when choosing your extracurricular activities. Also, make time for randomness, and especially make time to go to Blacks Beach—start surfing! Her favorite museum is…The Exploratorium in San Francisco because it’s very hands-on and encourages play. 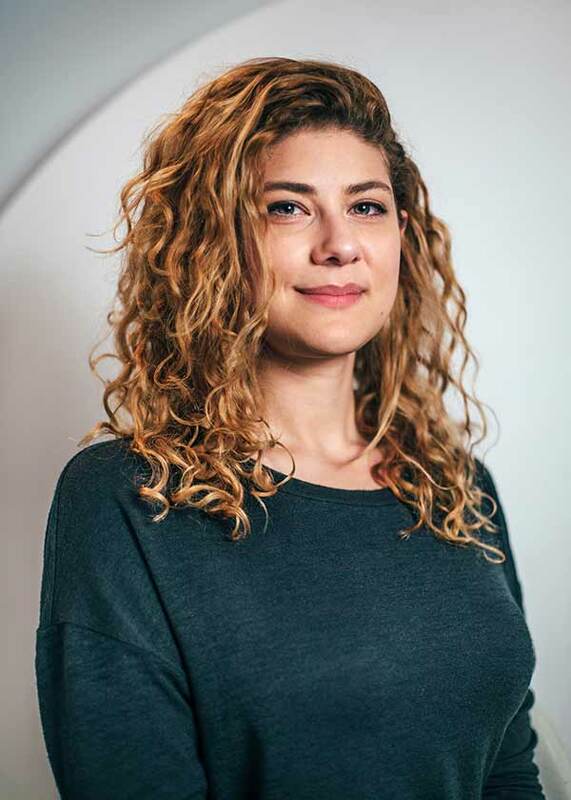 Amanda Schochet, UC San Diego alumna and co-founder of MICRO. Amanda Schochet could not have predicted that her love for science would lead her to become a storyteller who shares the wonders of the world via miniature museums. Schochet earned two degrees from UC San Diego, including a bachelor’s in biology in 2011 and a master’s in ecology, behavior and evolution in 2014. She went on to work as a computational ecologist for both NASA and the U.S. Agency for International Development before launching the nonprofit MICRO with her partner, Charles Philipp, in 2016. Their mission is to improve access to science education and redefine the museum experience. Based in New York City—and currently expanding to the Bay Area—the MICRO team launched their first museum in November. 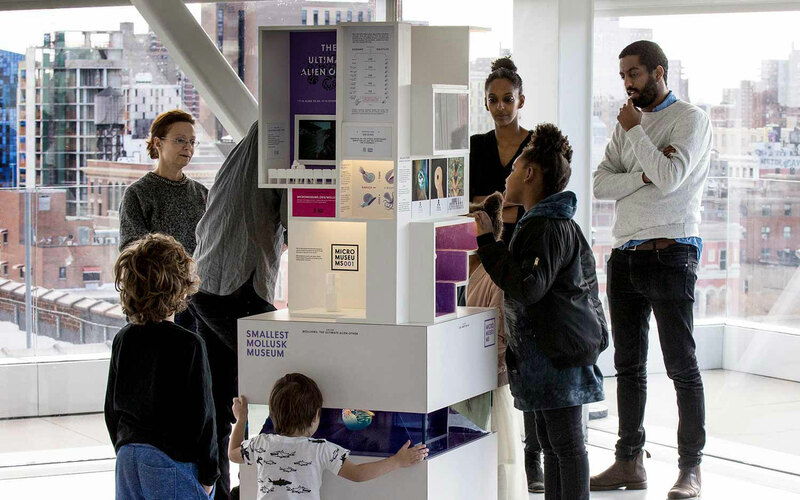 Called the “Smallest Mollusk Museum,” it invites visitors to “look at the small things that make a big difference in our world.” Contained within an asymmetrical box about the size of a vending machine are 15 natural history exhibits, eight sculptures, five videos, three optical illusions and one animated hologram. Each “chapter” is creatively designed to lure in even the most hurried passerby with eye-catching multimedia, 3D-printed models and infographics. In recognition of her dedication to sharing science, Schochet was named among the 2018 UC San Diego Triton 40 Under 40. The award honors the top 40 UC San Diego alumni under the age of 40 who embody the spirit of nontradition and are making meaningful, remarkable contributions to our campus and beyond. You’re at the airport and your plane departure has been delayed for three hours. In between staring at the news feed on television and halfheartedly browsing social media on your smart phone, you notice people crowding around a tall box, so you go to investigate. You discover that mollusks have lived on our planet for some 500 million years, and you start a conversation with a stranger about how octopuses can remember human faces. MICRO museums are made to cultivate these kinds of experiences, to draw people together in public places to discover new things about the natural world. At about 6 feet tall and 2 feet wide, they are placed in highly trafficked areas where people are prone to waiting—from train stations to hospitals and libraries. Through art and storytelling, visitors can engage immediately in learning without needing any prior scientific knowledge. In fact, while the project may have been inspired by a passion for science, the vision behind MICRO is driven by a much larger cause. According to Schochet, their mission is to democratize cultural institutions. She explained that museums are often clustered in wealthier neighborhoods—Manhattan, for example, has more than 80 museums while the Bronx has fewer than 10. In addition, admission can be expensive, limiting access to exhibits that all should be able to enjoy. How do you inspire someone to adopt a new perspective of the universe? This is the question that is on constant replay in Schochet’s head. She collaborates with designers, writers and scientists—sometimes up to 50 people per museum—to bring science to life through visual storytelling. 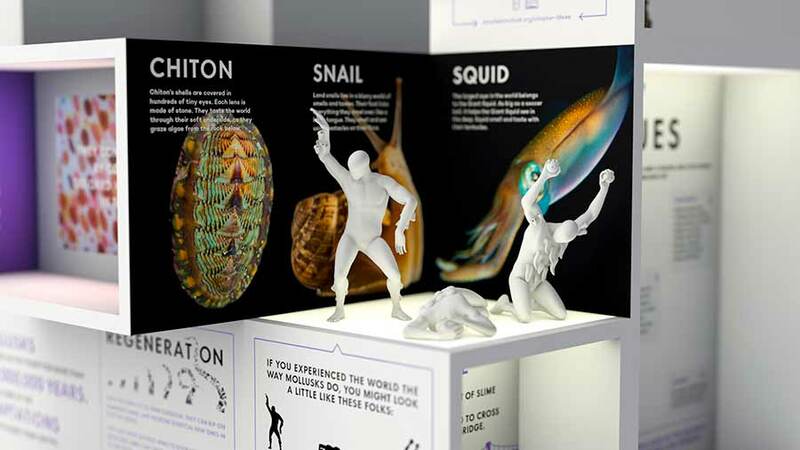 MICRO museums inspire curiosity by telling a story using optical illusions, 3D-printed sculptures, holograms and more. Curiosity is at the core of their exhibits. Using holograms, optical illusions and other visual techniques, they draw people in, leading them to ask questions and wonder how elements work. Rather than perfectly linear, the sides of the museum are carved out into cubbyholes and angular windows to look through and see people on the other side. The behavioral norms that typically dictate a museum experience—hushed conversation, ample space around each display—is largely forgotten as strangers begin to talk and share in the learning process. Each MICRO museum takes a year to develop and build. After the first prototype is complete, the museum is replicated and distributed to numerous locations. Venues can purchase museum installations that range from one month long to a whole year. With the support of organizations like the Simons Foundation, MICRO is also able to partner with institutions that are making a difference in the community but may not have the budget to provide these kinds of experiences. About the size of a vending machine, the museums can go anywhere. 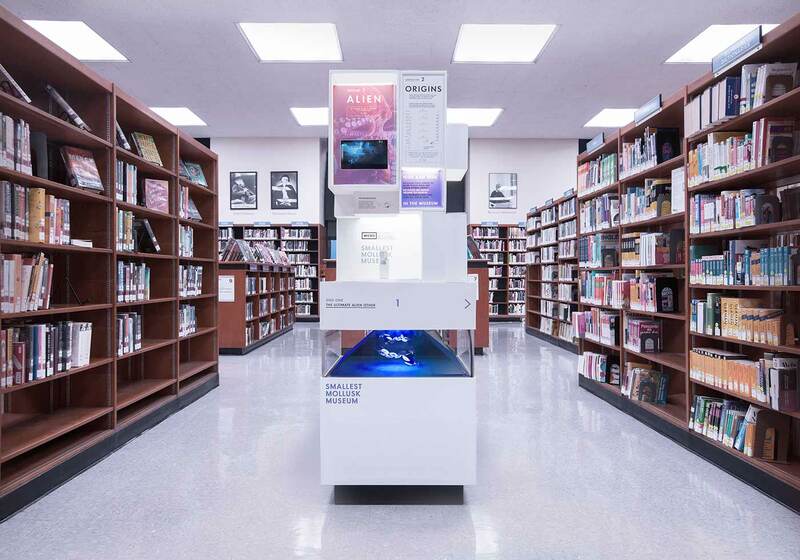 They are placed in civic spaces such as libraries, airports and hospital waiting rooms.